ஒக்ரோபர் | 2012 | அவார்டா கொடுக்கறாங்க? ரொம்ப நாளைக்கப்புறம் இன்று ஒரு பதிவு – நண்பர் ஈஸ்வர் கோபால் புத்தம் புதிய ஜேம்ஸ் பாண்ட் படம் பற்றி அனுப்பி இருக்கிறார். It is a pleasure to watch 007 movies, almost released once in 4 years. Wherever I am, however I am, I always make it a point to watch the first show of the movie as far as possible. This time too, Almighty did not keep blocks in my hopes of seeing one of the wonderful stunning performance of James Bond in a row. 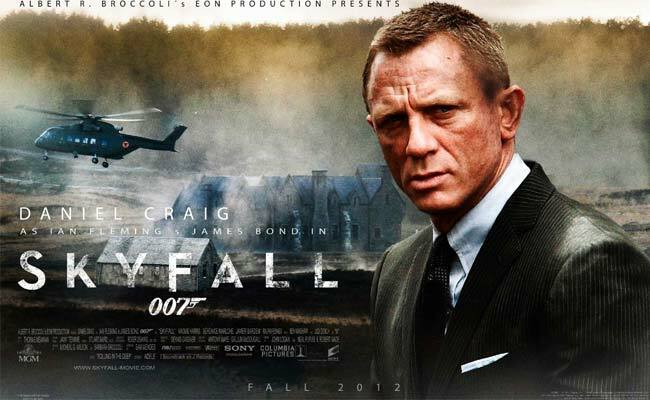 Skyfall released to audience today in all theatres in UAE. It is expected to be release in USA/India during first week of November 2012. It is 23rd spy film in James Bond series, presented by Columbia Pictures and Sony Entertainment. Daniel Craig’s third as James Bond. The Machiavellian crook as villain is Javier Bardem as Raoul Silva. The film is directed by Sam Mendes (Road to Perdition). This film release coincides with 50th anniversary of the series, started with Dr.No in 1962. As is the normal storyline in all James Bond movies – the first 20 minutes goes like a rocket and gives a stunning chase of the assassin by James Bond in the background of Turkey. The chase at the roof tops, penetrating through the market, diving, jumping, stunt scenes at the top of running train is awesome and worth the money. 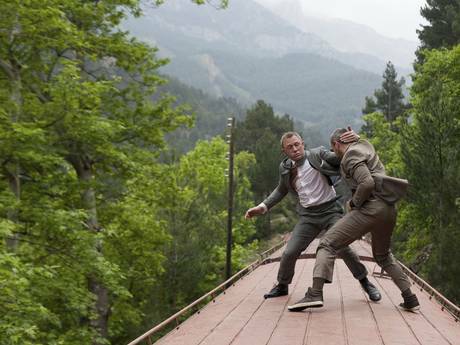 The fighting sequence in Shanghai in China is well filmed and gives a satisfactory result to the Bond fans. 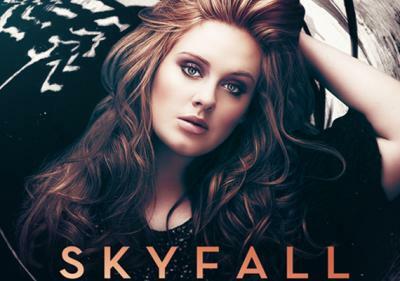 The title song, by Adele, starting with “This is the end Hold your breath and count to ten Feel the Earth move and then Hear my heart burst again” goes well with lyrics of Paul Epworth. It gives a soothing effect to the background title for James Bond. The film starts with capturing an undercover in Istanbul, Turkey – it ends in fiasco. James Bond was shot and presumed to be dead. In the process, the identities of active undercover MI6 (Her Majesty’s Intelligent Service-Section 6 – formally known as MI6) is leaked on to the Internet. MI6 (Head – Judi Dench who has acted 6th time in a row in Bond movie) capability to run the department is questioned. (She is referred to as M in short in the original Ian Fleming’s novel – Ian was inspired calling his Mom as M and this may have prompted to name ‘M’ for Secret Intelligent Chief) She becomes the object of attack and grilling by the Top leadership in the British Government. While the confusion surrounding MI6’s leak is growing, Bond’s sudden resurrection, MI6 Head seeks to capture Raoul Silva – a dangerous villain unleashing terror from South China Sea, Macau, London. Did he find him? Did M proved her ability to unearth the person who leaked the secrets? Was he arrested or shot? The balance is exhibited in silverscreen. The music is superb as in any James Bond movies. The song seems to soothe the atmosphere and bring down the emotional appeal to serene surroundings. The song was composed by Paul Epworth and sung by Adele Adkins. Despite the good start and flow, suddenly the movie rolling back to 1st gear and scenes are somewhat boring. However, the in-between story-line is sprayed with a few salt and sugar keeps the viewer happy. The close scenes as seen in any 007 movies, is eaten by Censor’s kitchen knife fall short of pleasing the Bond fans here. The stunning escape scene of the villain from the heart of MI’s high security prison and Bond chasing him through the metro tunnel and the metro coming down the tunnel after bombing are a must-not miss variety. There were lot of usual gimmicks that Bond performs in all his movies are missing. For instance, Bond’s favourite classic cocktails dialogue “Vodka Martini, shaken not stirred” is not to be found. 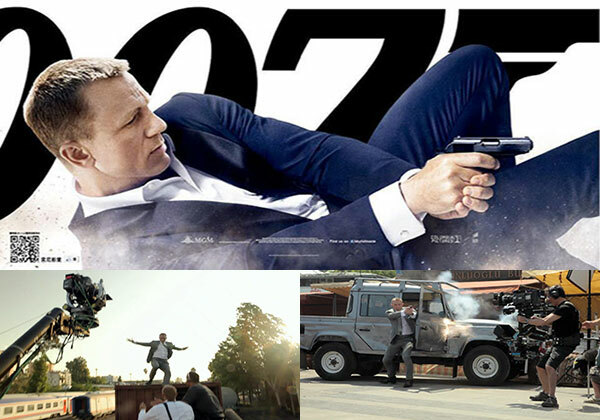 He uses JB5 Aston Martin car with fully equipped fire power, which uses at the climax scenes. Bond is getting infuriated further when he sees his loved JB5 is exploded by the villain. You should go with a free mind with a stern thinking that you are watching a 007 movie. It is rated +15, though no objection portions are exhibited here (at least in UAE). Judi Dench as M acted very well. Infact, compared all her previous roles in Bond movies, this movie role is extended and she gives a satisfying acting. She dies at the end to show this may be her last movie? Don’t know, but go and watch you will enjoy. The stunning performance by Daniel Craig proves again that he is going to stay for more time as Bond. The villain Raoul gives equally fitting performance and narrating the Rat story to Bond is awesome. The electrifying chase, stunts, action packed adventure keeps your adrenaline on the high. Keep in mind – don’t ever go after the start of the movie – this rule is for all Bond movies.